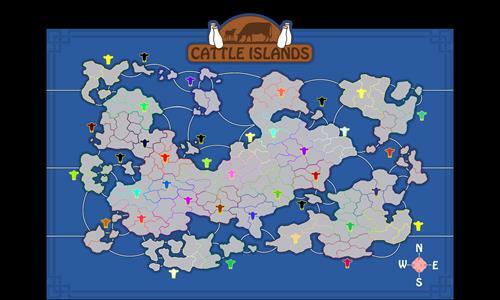 This map is the first installment of a parody of Chaos's well known maps, the Battle Islands. Every territory is named cow or calf in a different language. Extra special thanks to Lionheart for assisting with some of the artwork. Guy is a real artist. Review by lonely star on 9/15/2017. Review by Lionheart on 9/16/2017. There is a new map called 'Gotham City' by Lionheart, it is amazing. Go play it. If you are unfortunate enough to end up playing a game on this map instead, I'd recommend opening the menu tab and surrendering as soon as possible. Review by daftpunk on 9/29/2017. Review by ҈ TeeMee123 ҈ on 9/16/2017. Really milking the battle islands thing (if you'll pardon the pun), it's fair though as this is/was a great map. Review by Daryle on 10/9/2017. Review by DanWL on 12/22/2017. Nice art, well balanced. Good for team games.